What guards your heart? What protects your mind? 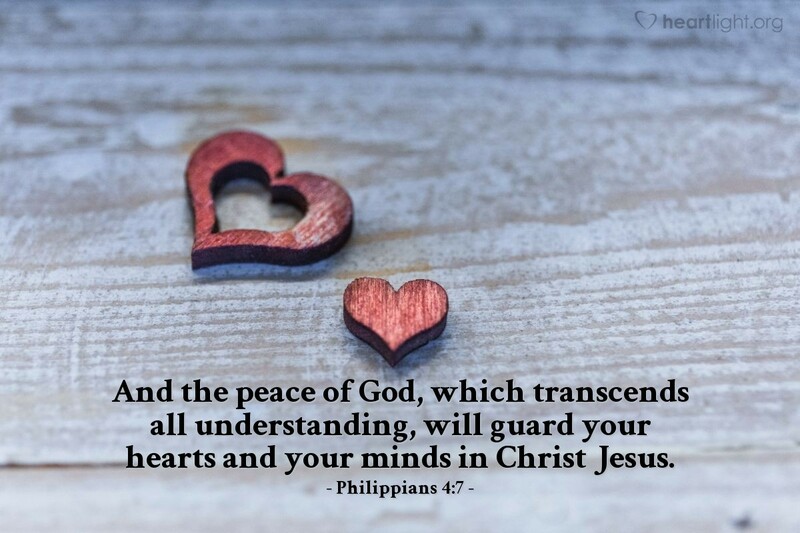 Did you know that the peace of God can stand guard over our hearts and minds? That's the apostle Paul's promise to us in this passage. If we will present our requests to God, with thanksgiving, then God's peace that is greater than any explanation and that transcends our ability to comprehend it, will stand sentry over our hearts and minds. You want an example of how this is true? Look at the book of Job. All that befalls him. All that wounds him. Yet still he doesn't become hard of heart or go insane. What is the key to his survival? His ongoing conversation with the LORD. He will not relinquish that relationship no matter how badly he hurts, how much he is confused, nor how badly he is ridiculed. Father, I need your peace. There are wounds that pierce my heart, but I don't want it to become hardened and callused. There are times my mind is so confused that I fear I may lose my rationality. Dear Father, I trust that as I cling to Jesus, and as I speak openly with you about my life and your grace, that you will bless me with your peace and will protect my heart and my mind from destruction. Thank you, dear Father, for the reminder that even as I struggle with my troubles, I also need to give you thanks for all the good things that you have blessed me with in my life and my walk with you! In Jesus' name I pray. Amen.